Ever Wonder…What If? You don’t have to wonder any more…now you can see the results instantly! Go ahead and try it. 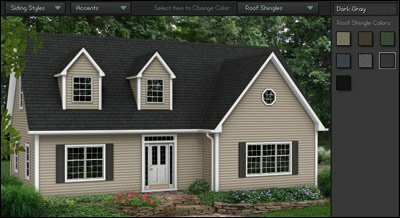 See how your house might look with blue trim and a white door, or brown siding with cream accents, or green shingles and…well, you get the picture. Now is your chance to get creative before you ever spend a penny. And if you happen to create your dream house in the process, give us a call. Our expert staff will be happy to help you turn that dream into a reality. Try the DESIGN SHOWCASE application.